on our way to this village we passed several beautifull cascades which fell from a great hight over the stupendious rocks which cloles the river on both sides nearly, except a small bottom on the South side in which our hunters were encamped. the most remarkable of these casscades falls about 300 feet perpendicularly over a solid rock into a narrow bottom of the river on the south side. Multnomah Falls, a magnificent two-tiered waterfall with a total height of 620 feet, is the top tourist attraction in Oregon, so it’s hard to get a sense of how it must have appeared to Meriwether Lewis and William Clark as they passed the falls on their way down the Columbia River in 1805 and again on their way back east in 1806. Lewis & Clark did not name the falls; “multnomah” is believed to be a Chinook Indian word meaning “downriver” and has been in use since before 1860. Multnomah is only the largest and most spectacular of a series of waterfalls in the Columbia River Gorge. The falls are the results of one of the biggest geological cataclysms in the history of this planet: the Missoula floods sometimes called the “Bretz floods” after the geologist who uncovered them, J Harlen Bretz. In the 1920s, Bretz realized that the land in the Columbia River Basin was the product not of years of erosion, but of a cataclysmic event caused by the breaking of an ice dam near present-day Missoula. The dam’s failure unleashed floods of stupendous force, scouring out landforms in a matter of hours rather than millennia. In the case of Multnomah Falls, the floods altered the Columbia Gorge so that the rock faces lining the river are sheer vertical drops rather than eroded cliff faces, allowing for the unique waterfalls that have delighted visitors to the area least as early as 1883, when a wooden pedestrian bridge was built, giving travelers on the newly completed railways a thrilling closeup view of the lush alcove and the falls therein. The epic construction of the Columbia River Highway provided an opportunity to further enhance the visitor experience at Multnomah Falls. 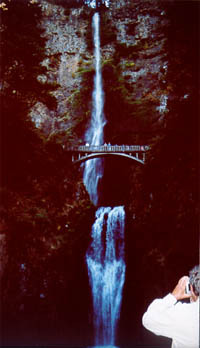 The engineer of the construction, Samuel Lancaster, wrote of Multnomah Falls, “the setting is ideal. It is pleasing to look upon; and in every mood, it charms like magic, it woos like an ardent lover; it refreshes the soul; and invites to loftier, purer things.” Logging magnate Simon Benson of Portland purchased the land around the falls and donated it to the city. The cathedral-like expanse known as the “Benson Bridge” was built in 1914, and the adjacent lodge in 1925. These historic structures lend a warm and interesting human touch to nature’s handiwork at the falls. You reach the bridge by a slippery footpath — the falls are so mesmerizing that I almost went plunging to my death trying to walk and look at the same time, so be careful! I loved Multnomah Falls. I didn’t hike to the bridge, but got lots of great pictures and enjoyed the beautiful scenery. Thanks for reminding me of a fun vacation along the Lewis and Clark Trail.